"Hockey is central to so many childhoods, so many great family moments, part of all our communities," said Ford. "Our government is proud to take action and cut red tape to provide clarity and help make sure the OHL is able to continue training players and showcase this great sport." By excluding OHL players from the Employment Standards Act, owners and operators of OHL franchises will have a level playing field with owners of major junior hockey teams in other provinces, including British Columbia, Manitoba and Quebec. Teams will be able to continue to help players develop their hockey skills at an elite level and provide comprehensive educational supports during and after a player's OHL career. OHL players will still be protected by legislation such as the Occupational Health and Safety Act. "Major junior hockey is essential to the development and promotion of one of Canada's most important sports," said Michael Tibollo, Minister of Tourism, Culture and Sport. "Amateur hockey is part of Canadian life," said Ford, "and we're ensuring it stays that way." 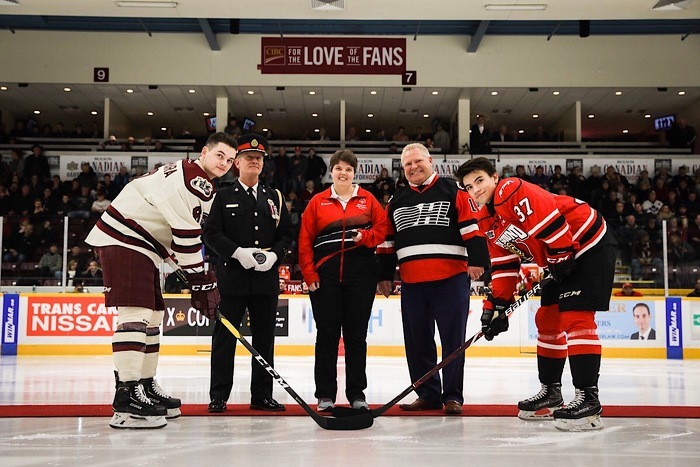 Premier Doug Ford (middle right) and Peterborough's Police Chief Scott Gilbert (middle left) look on as Peterborough Special Olympics bowler Crystal Cochrane (centre) drops the ceremonial puck at the start of the Peterborough Petes home game against the Owen Sound Attack.